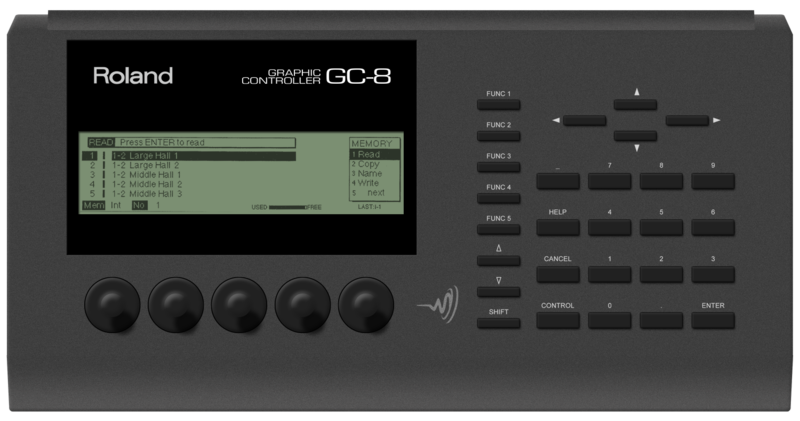 The Roland R-880 Digital Reverb and GC-8 Graphic Controlier are the first in a new generation of signal-processing devices for the professional recording, production, and post-production studio. They incorporate highest-quality sound-processing circuitry, along with state-of-the-art processing algorithms, and fully digital inputs and outputs, in a highly flexible environment controlled with an intuitive graphic interface. The Roland R-880 is a multi-mode device, providing a wide variety of effects in an almost unlimited range of configurations. The processing modules, reverb, early reflections, gates, delays, chorus, equalizers, and compressors – exist purely in software, and so can be configured in any imaginable order or combination. Signals from the two input channels can be processed independently, and their paths split and combined through any modules on their way to the fourindependent outputs. Because there is no analog/digital conversion between the modules, there is never any degradation of the sound quality no matter how many modules are in use or how complex the signal paths are. 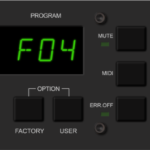 The Roland GC-8’s LCD display is designed to make the task of arranging the modules and signal paths, as well as configuring the modules themselves, simple and intuitive, using a ”desktop” “metaphor that will be familiar to users of modern personal computers. It uses graphics to show the processing algorithms from the most direct to the most complex, and to show all of the parameters of an individual module simultaneously. Menus are used by the software to move around the operating system.